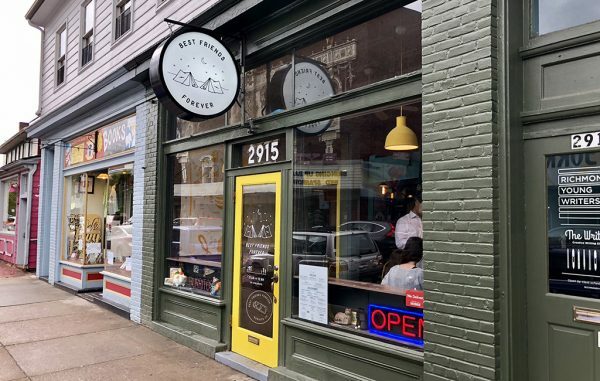 In the midst of reopening their former Carytown taco shop in new Scott’s Addition digs, the owners of Don’t Look Back are shutting down their other restaurant on Cary Street. Best Friends Forever on Friday is closing its shop at 2915 W. Cary St., where it launched about a year ago as Eleven Months. Co-owner Hamooda Shami said the closure wasn’t a function of BFF’s performance, but rather the need to focus on the brisk business they’ve experienced at Don’t Look Back Triple, the recently opened reincarnation of their Carytown taco shop that was displaced 10 months ago by a fire. He is working with a local, independent operator to take over the Carytown location, but did not disclose details about the pending transaction. Shami and business partner Nate Gutierrez opened Don’t Look Back Triple about a week ago in the long-dormant Triple Lounge space at 3306 W. Broad St. in Scott’s Addition – drawing in lines of taco fans after the restaurant’s 10-month hiatus. Shami said the volume at the new space placed tremendous demand on staff, prompting him to shutter BFF and shift its remaining employees to the Scott’s Addition joint. With the closure, Shami said the remaining wait and cook staff at BFF have been transferred over to Don’t Look Back Triple. Don’t Look Back Triple will be closed Monday for training, he said, but is open daily from 11 a.m. to 2 a.m. The Scott’s Addition location is nearly triple the size of its former digs in Carytown, Shami said, with 100 seats. The location also includes a gaming area with three pool tables (holdovers from its days as a pool hall), and a shuffleboard that’s on the way. Like its former Carytown location, patrons will find many of their favorites on the menu, including shredded chicken, chorizo and shrimp tacos served gringo-style with cheese, lettuce, sour cream and salsa; or traditional with cilantro, chopped red onion and lime. The location also will offer burritos, quesadillas, nachos and Frito pie. Beer, wine and margaritas also are on the menu, as is a kid’s menu. Meanwhile, the duo is working to open Don’t Look Back South, another new location at 7524 Forest Hill Ave. They hope to have it ready by summer, Shami said. 1 Comment on "Don’t Look Back owners shutter Cary St. venture"